Easy Carry Package with 9PCS Included: One Set Package Including:2 front seats covers,2 backrest covers, 2 shoulder covers, 1 steer wheel cover, 2separate headrest covers. Provides excellent all-around protection against physical hazards such as abrasion and cut. FASHION DESIGN IN RICH AND PERFECT COLORS . Looks gorgeous and feels really nice when driving. 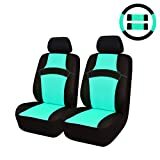 Make your car seat looks so different than others. Get the compliments by using our RAINBOW car seat covers NOW. Easy Carry Package with 9PCS Included: 2 front seats covers, 2 backrest covers, 2 separate headrest covers,2 shoulder covers,1 steering wheel cover. •Easy Carry Package with 9PCS Included: One Set Package Including:2 front seats covers,2 backrest covers, 2 shoulder covers, 1 steer wheel cover, 2separate headrest covers. Provides excellent all-around protection against physical hazards such as abrasion and cut.